Rangoli, also known as Kolam or Muggu in south india, is a folk art in India in which patterns are created on the floor in or outside houses using materials such as rice flour, powder colors, white rock powder, flower petals, cow dung etc. These are drawn during festivals like Diwali, Sankranti, Ugadi etc. 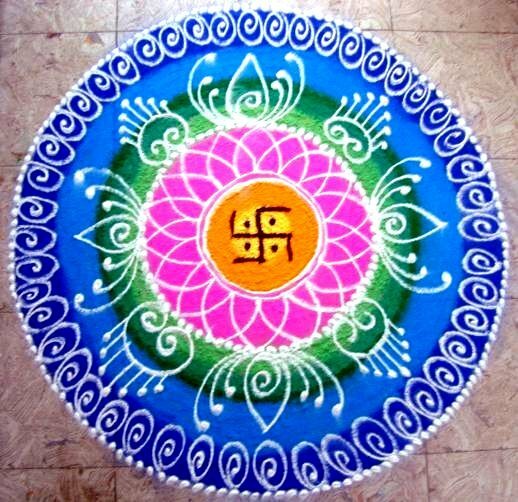 They are known as Rangoli in North India and Karnataka, Kolam in Tamil Nadu and Kerala; Mandana in Rajasthan; Chaookpurna in Chhattisgarh; Alpana in West Bengal; Aripana in Bihar; Chowk pujan in Uttar Pradhesh; Muggu in Andhra Pradhesh. Rangoli designs can be simple geometric shapes, deity impressions, or flower and petal shapes (appropriate for the given celebrations), but they can also be very elaborate designs crafted by numerous people. The base material is usually dry or wet powdered rice or dry flour, to which sindoor (vermilion), haldi (turmeric) and other natural colors can be added. Chemical colors are a modern variation. Other materials include colored sand, red brick powder and even flowers and petals, as in the case of flower rangolis. This tradition has been passed on from mothers to daughters for multiple generations. Today, modern women do not know the significance of these Rangoli and they neglect this art. Initial pattern of Rangoli is by using 108 dots (you might be already knowing importance of 108 number in Mantras) and rice flour. As soon as it is drawn, small birds, ants, insects etc start feeding on the flour, which is again part of the Rangoli. Rangoli or Muggu designs existed since vedic age and cymatics of audible and inaudible mantras were known to vedic rishis. Sanskrit Mantras have precise golden ratio of 1.618 sound harmonics ( Fibonacci/ Sri Yantra ) in digital mathematical and geometrical precision. There is a direct phonetic link between longitudinal wave sound and visual signs. Mantras are Scalar energy based sounds which resonate in the Zero Point Field Aakashik hyperspace. Mantras resonate your pineal gland . Pineal glands of Vedic seers were the size of a ripe lemon. Ours in this 21st century is the size of dried raisin. The human DNA can produce longitudinal scalar waves, faster than light. A mantra is a carrier wave with potent information within it and mantras reprogramme our DNA. Mantras increase your Auras due to the effect on symphathetic and para sympathetic nervous systems. If someone has a pet cat at home, they can observe how it loves to sleep in between a Rangoli, due to its vibration. Most of the original Muggu or Rangoli designs are yantras or shapes of dieties formed by joining specific number of dots. Nowadays, Rangoli has been confined to English New Year and some random designs or faces.